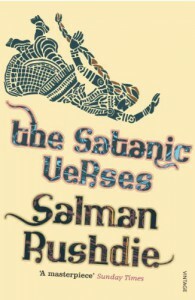 With its electrifying first chapter, Rushdie's most controversial novel sets the scene for dramatic and mystical events to intrude violently into the well worn land of the living. His grandiose language lends itself to reading aloud to your family when caught in crawling motorway traffic in a thunderstorm. Trust me on this. I got bored of the more fanciful strains of the magical realist strand of this novel, set in modern England, and was far more intrigued by the 'historical' strand drawing on & reimagining episodes from the Qu'ran.